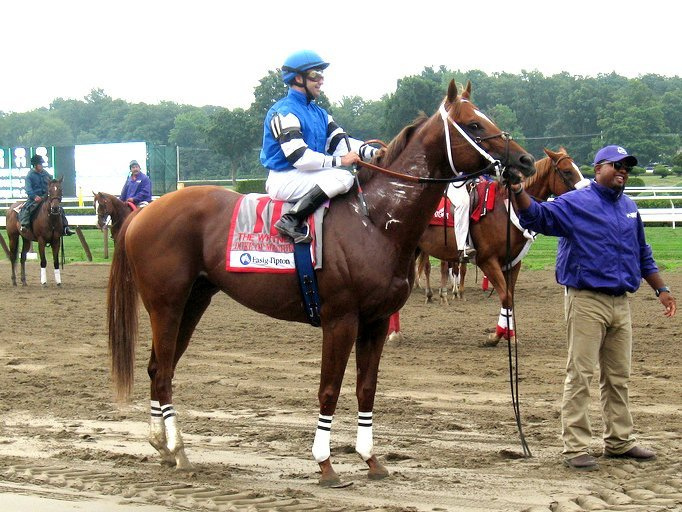 Quick, say it with me, who is our favorite non-retired racehorse rags-to-riches champion feel-good real-life horse? Just another international show jumping champion/children’s pet found on a meat truck. Of course it’s Snowman, what other choice could we have? The big grey plow horse who went from the New Holland kill-buyer, literally bought right off the van to slaughter, who went on to become an international show jumping champion/family pet, has to be one of the greatest horse stories of all time. He’s amazing because he’s true. 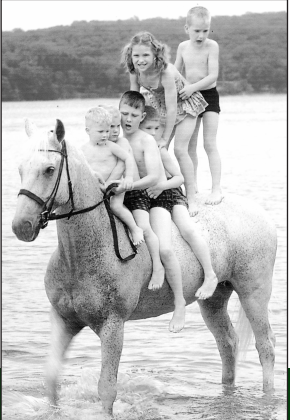 Snowman’s biography, The Eighty-Dollar Champion: Snowman, the Horse That Inspired a Nation, has been a best-seller since its release in 2011 (and the Retired Racehorse review remains one of the top posts on this site). Now the next best thing to a book, a documentary, is being made about Snowman, and you can help. HARRY AND SNOWMAN is being produced by Docutainment Films, who have made two documentaries before, both about beauty pageants. Wait! Not just beauty pageants. The first one, PAGEANT, is actually about contestants in the 34th annual Miss Gay America Pageant, so that’s pretty cool. Featuring stunning musical numbers, this movie dives into the heart and soul of this make-believe world: the men behind the make up. The second one, MISS YOU CAN DO IT, is about the first woman with disabilities to participate in the Miss USA Pageant, and the pageant she would create, Miss You Can Do It, specifically for girls with disabilities. Abbey founded the Miss You Can Do It Pageant in 2004 and girls and their families travel from around the country to participate in this event where their inner beauty and abilities reign. In other words, the people at Docutainment seem pretty interested in finding the heart-and-soul stories of underdogs with big dreams and seemingly impossible hopes. I think that anyone of us who has ever taken a look at a rag-tag bucket-of-bones horse and seen a show horse, let alone a champion, can appreciate that. This is a wonderful excuse to climb into the attic and pull down all those boxes of horse memorabilia that the people around you said was a waste of time and space to keep, open them up in the living room, and scatter old newspapers about horse shows all over your house. Especially as the weather is supposed to be bad. Just make some coffee and have a good time with it. And if you don’t find anything that’s been requested for the Snowman project, you’ll still have a good time looking at old horse stuff. That’s never a waste of time. And head over to the HARRY & SNOWMAN website to watch a great little video preview, featuring photos and film footage of Harry looking frankly very dangerous as he jumps Snowman over huge obstacles with neither a hard hat nor what I would call a steady lower-leg position, and then letting that adorable horse carry his adorable children around on swimming excursions. It’s going to be an amazing, wonderful film about an amazing, wonderful partnership! The email and the kill-buyer’s quote were precipitated by an investigation by Ohio racing authorities into the whereabouts of two Thoroughbreds, Canuki and Cactus Cafe. The two racehorses simply disappeared from Beulah Park in May, despite having had foster homes secured for them, when their trainer hauled them off the backside. The Internet rallied, as the Internet does, and an investigation goaded the trainer into returning the horses alive, albeit in poor condition, albeit with the trainer refusing to tell the stewards just where the horses had been. It’s a case that illustrates the difficulties with the no-slaughter policies at racetracks: yes, the horses can’t be sent to auction and sold to kill-buyers… but then again, they can go to Jimmy Jo Bob’s Horse Farm on Wednesday and Jimmy Jo Bob can sell them on to the killers himself on Friday. The trainer wasn’t involved, the owner wasn’t involved, Jimmy Jo Bob isn’t affiliated with the racing industry so they can’t exactly pull his license or levy a fine, so… that’s that. These particular folks are so fed up with anti-slaughter advocates that they flung up their hands and said no more Thoroughbreds. I’d like to see other horses just as fortunate, for sure. I’d like to see other advocates for other breeds stepping up to save the culled herds of Quarter Horses, Arabians, and other prime offenders in the ship-the-rejects-to-slaughter business. But let’s take a minute and be really, really proud of how annoying we, the Thoroughbred people, are. I live in Park Slope, Brooklyn. It’s a famously liberal, tree-hugging sort of community, where anyone who is anybody dutifully works their shift at the Food Co-Op in exchange for membership (I am not anyone) and there are still placards in the windows of million-dollar brownstones that say HOPE and CHANGE and SAVE DARFUR. There are tables set up on the street so that you can stop and change your electricity over to sustainable up-state wind-farms while you’re on your way to enjoy some locally farmed veg and eat a chicken who probably had a name and came when he was called. Yes, I live in Portlandia. One of the fun things about Park Slope is the “All the streets are my Good-Will” mentality. If you have something you don’t want anymore, you put it out on the sidewalk, or your stoop, or hang it over the fence around your little garden. I’ve gotten many great books this way, including, interestingly, a hardcover of A Horse Around the House and a tattered paperback of Sam Savitt’s Vicki and the Black Horse, which will eventually be chopped up and used to decorate my already horse-centric apartment. And it turned out, of course, that the Mouse Trap game was missing one piece. Just one piece, but a necessary one. The Mouse Trap wouldn’t work without it. Thanks, I thought. Thanks for your sweet broken toy. Every day, broken horses are put out on the virtual stoop. They’re listed on Craigslist, they’re posted on Facebook, they’re put onto free classifieds ad sites. One thing they have in common? Their listings are always free. No use putting money into these broken toys. I’m sure I speak for many when I say I’m tired of seeing horses offered cheaply, or for adoption, or for free, when they’ve been broken by someone else. Horses do not fall apart without warning signs; bodies do not give up without symptoms of stress. Horses speak up, but are frequently ignored. Things that should never be thought, but are anyway: Just jump one more course, just run one more race, just get through one more season. Okay, says the horse. I will try. And that’s the part that doesn’t break, the piece that never goes missing. The try. That’s the thing about these broken toys: when they’re put back together, they’re just as wonderful as when they were new. Luckily, there are good people out there who can’t help but pick up a broken toy. There is something in them that makes them want to fix it. There is something in them that helps them see what else the toy can do. Maybe it can’t be Mouse Trap anymore, but maybe it can be something else, and we can all still have a good time. So hey, all you dealers and dumpers and shady traders and low-life trainers, from every discipline and every walk of a horse’s life: You’ll get yours. Thanks for all the broken toys. This horse contributed more to the economy as a show horse than as an entree. Yes, Trent Lott, our former Senate majority leader, who resigned his seat following a controversial mutter that Strom Thurmond should have been elected president, despite being on the ticket as a member of the openly racist Dixiecrat party. Sometimes I wonder if he just said it to be nice. Or to curry favor. I don’t know. But it back-fired. His experience showed me that live, active horses support an important infrastructure of jobs and economies in the United States. A live horse needs to be fed, groomed and trained, as well as receive vet care, among other things. This in turn creates and maintains a viable and enduring way of life in rural America. The sale of horses to killer-buyers in fact generates very little profit for the seller while simultaneously choking off the demand for the goods and services that other buyers would create. This reminds me of a similar argument I’ve made regarding people who think that horse racing should not receive any sort of help from the government. Whether or not you believe that any business unit should be subsidized by federal or state dollars, to deny that the horse racing’s overall affect on the economy does not stretch far beyond the handle at the local racetrack is to be incredibly short-sighted. Who gets paid, when there are horses to be taken care of? Farriers, grooms, veterinarians, feed store owners, hay farmers, tack stores, manufacturers of horse clothing, of saddlery, fencing supplies, building and home improvement stores, tractor companies, auto-supply stores… horse breeding, alone, while usually far from the urban centers that support (however poorly) racetracks, is a mainstay of many agricultural and rural communities. Livelihoods depend on the horse-racing industry, just as surely as any other. You just don’t see them; that doesn’t mean they don’t exist. And how much money do you spend every year on your horse? Even if your horse lives in your backyard and you don’t show? What are you contributing to the local and national economy every year? Whose livelihoods depend on your hobby, or your profession, or your obsession? I support this legislation for three compelling reasons: Banning horse slaughter would save taxpayers millions of dollars every year, as it would eliminate a wasteful federal program that only serves to benefit a handful of foreign-owned companies; it would help foster and promote sustainable jobs in rural America; and it would end the needless suffering of more than 100,000 American horses each year, which are hauled across the United States to slaughter houses in Mexico and Canada to supply so‐called “high‐end” restaurants in France and Belgium. Maybe there are people out there who don’t speak in the language of the modern American horse owner, who keep horses as pets and kiss them on their noses. That’s okay. Maybe there are people out there who don’t speak in the language of the rescuer, who thinks every living thing deserves a chance at, well, living. That’s okay. But come now. They all speak the language of money. Lott has written a compelling argument for passage of the American Horse Slaughter Prevention Act, and I, for one, appreciate it. Funded initially by seed money from Breeders’ Cup, Ltd., The Jockey Club, and Keeneland Association, the TAA is comprised of owners, trainers, breeders, racetracks, jockeys, aftercare professionals and other industry groups. Additional support of the TAA has been provided by Adena Springs North, CARMA, Fasig-Tipton, The Jockeys’ Guild, New York Thoroughbred Horsemen’s Association, The New York Racing Association, Ocala Breeders’ Sales Company and Thoroughbred Charities of America. The organization also received staff support from Thoroughbred Charities of America, the Thoroughbred Owners and Breeders Association and the National Thoroughbred Racing Association (NTRA). Adena Springs, in particular, have already proven themselves to be responsible breeders, finding horses that need to be retired and providing down-time, retraining, and re-homing services for their home-breds. The Jockey Club, too, has started to ramp up their efforts to provide retirement resources and positive press for OTTBs, including Thoroughbred Connect. And of course the NTRA has made after-care a priority, and has done a great job integrating OTTB stories into their racing outreach. So kudos to all the groups who are making things happen in racehorse retirement! The TAA will accredit aftercare facilities based on a Code of Standards covering operations, education, horse management, facility services and adoption policies. Oh they will, will they? I didn’t see any reference in the press release to any current Thoroughbred re-homing organizations, the people who have had boots on the ground in this issue for decades, and I don’t see any references to any sport horse organizations, the people who they need to be reaching out to in order to get their horses into new jobs. Are they going to concentrate on retiring these horses for life, or getting OTTBs into new careers? A central, founding principle of the “Aftercare” solution must include an increase in the number of sound, able retirees who are able to go into new careers. There is not enough room in this country for tens of thousands of broken-down two, three, and four-year-olds to live in pasture for the rest of their lives. This appears a little one-sided, as usual. Once again, the horse racing industry and the sport horse industry find themselves hopelessly disconnected. Please prove me wrong. Also on the nets there is this article at the Atlantic’s website, a rather doe-eyed and innocent look at the world of cheap horses and slaughter. The author, who describes visiting auctions with her parents, and her father’s refusal to sell to kill-buyers, as a childhood ritual, is back to help her parents disperse of their (already underfed) horses. This time, the kill buyers we used to duck would likely not be a problem. Five years ago, the U.S. Department of Agriculture stopped funding inspections of the three U.S. slaughterhouses that processed horse meat, effectively closing them. I’m disappointed at the Atlantic, one of my favorite magazines, for printing an essay with such an incorrect premise: that kill-buyers were no longer the norm at auctions. I’m also a little disappointed in the author, for thinking even for a moment that sending skinny horses, including a Belgian, an unbroke four-year-old, and a bucking horse, to an auction would end well. So many strange arguments in favor of horse meat on the table! It increases the value of horses, or provides a suitable ending for “unwanted” horses, or relieves the unnecessary burden of horse carcass disposal from landfill facilities. It’s too bad not enough people realize that horse meat is, in fact, POISONOUS. Tiny little detail. So when a friend pointed out a column in the Toronto Sun about a merry little adventure eating cheval at the local French bistro, I was less impressed by his sarcastic quips about John Wayne and War Horse, and more concerned about his health insurance. It’s delicious. Horse is remarkably tender, lean and sweet and it’s packed with protein and iron. Too bad it’s horse. I hear “hi-yo, Silver!” every time I chew. Haha, a hi-ho Silver joke while he’s eating a horse. Oh, and dude, your girlfriend thought it was awful? That’s probably because she’d sweated a few legs with furazone in her time. Liz O’Connell stepped up and wrote Strobel a much-needed correction to his article, which she was nice enough to share with me. I thought it was too good not to share with you. Horse slaughter has not resumed in the US. Recent federal legislation enabled funding of slaughter house inspectors, but my understanding is none of that funding has been appropriated. So the horse meat you are eating, if it is from the US, is more than likely tainted with a whole host of pharmaceuticals. The drug I would worry about most if I indulged in horsemeat would be chloramphenicol. It is routinely given to horses in the US — and is a surefire way for a human to develop aplastic anemia. To even administer the drug to a horse, I have to wear double surgical gloves. Then there is furacin which is a listed human carcinogen. If a horse gets a wound, furacin is the first defense. 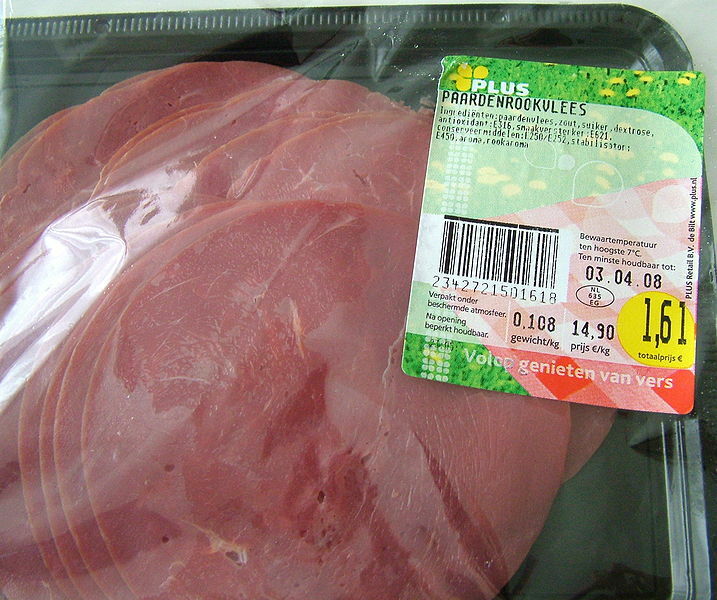 Did you know that horsemeat is a major conduit for trichonosis? There have been fatal outbreaks in Europe. The problem is the dewormer that is effective against the trichonosis parasite is outlawed for use in animals slaughtered for human consumption. And once the parasite encysts in the horse’s muscle the dewormer doesn’t work. So there the parasitic worm it sits, waiting to be eaten, ready to colonize a gourmand. Well said, Liz! If this doesn’t result in late-night visits to WebMD, I don’t know what will. Strobel: A horse for first course | Toronto & GTA | News | Toronto Sun. Thanks for visiting Retired Racehorse Blog! This is my first and favorite writing project - devoted to Off-Track Thoroughbreds. 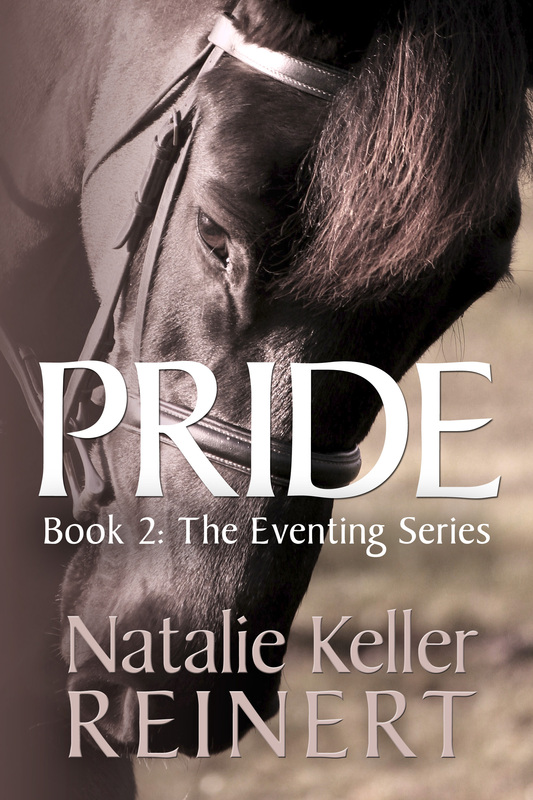 Please visit my personal site at http://www.nataliekreinert.com for more information on my equestrian fiction and romance novels, as well as freelance writing and social media assistance for companies and publications.